BIG NEWS!! Chieftain returned to the PAOBA Breedes Showcase with four offspring that took blue ribbons and TWO Championship banners! In 2009 Chieftain was the Color Champion at the PAOBA Breeders Showcase...and Judge's Choice! With a Color Champion in brown...the oldest one in the championship class...and a Reserve Champion in fawn...the youngest, Chieftain demonstrated he has color, fineness, and density covered. Did we mention he was also the Get of Sire winner...go Chieftain! Another Blue. Chieftain has a strong, square frame with soft, bright fiber everywhere. Want crimp? He has it from his top knot literally down to his knees! His dam is our finest fibered colored female and his sire is the legend-in-the-making Six time Color Champion Peruvian Lancaster. What a great match-up this was for color and fiber! Chieftain's numbers from his 2007 histogram are MOST impressive, and even more impressive is his ability to maintain those wonderful fiber stats. Chieftain has earned Blue ribbons and Banners as a juvenile, yearling, and mature male. With seventeen Blues he has been judged by just about everyone and all agree...this is one awesome male. Chieftain has proven his ability to maintain his outstanding fleece characteristics even as a breeding male. During the Spring 2009 show season, he added two Color Championships (PAOBA and MAPACA), one Reserve Color Championship (Nationals), and the Judge's Choice Award at PAOBA. Judge Mike Safley compared him to a juvenile for the Championship at MAPACA and declared him the finest in the class. What a great compliment for a three year old! 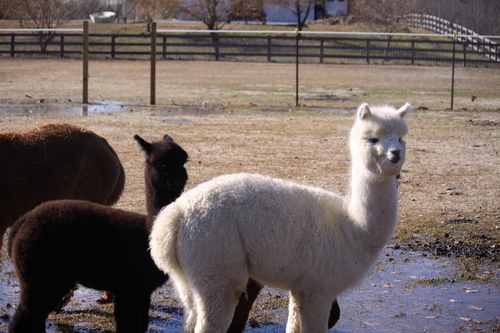 This is a herdsire you will want to breed to both your dark and light colors for fineness, density, and crimp. Judges put him at the front of the line for his combination of fineness and density. Isn't that what it's all about? Cherie is a real sweetheart! 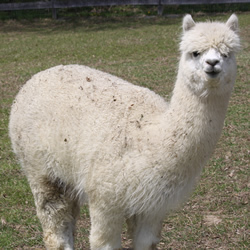 She has a very gentle disposition, is easy going and has absolutely wonderful fleece and lots of it. 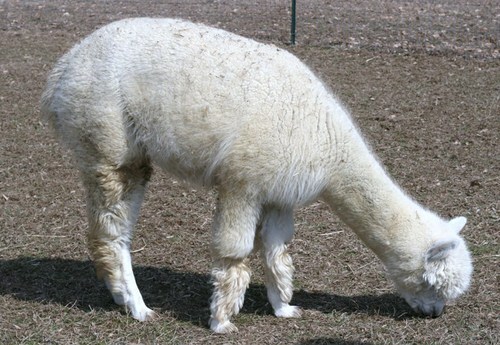 Her fleece is very fine (18.7 AFD), she has excellent staple length, density, nice crimp, and is very uniform. To top that off, check out her excellent genetics. Her sire is Lancaster's Highland Chieftain and her grandfather is 588 Peruvian Lancaster. 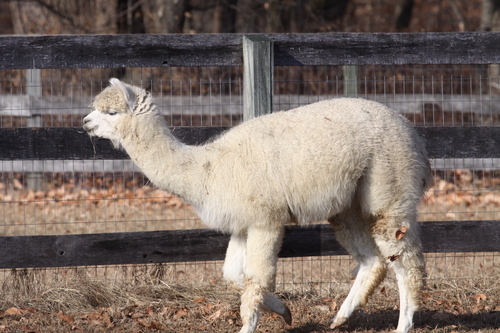 Cherie comes with one free breeding back to any herdsire owned by Painted Sky Alpaca Farm and she will make an excellent production dam!